, a Scotch divine, was born at Edinburgh, in 1568, and educated in the university of that city, under the direction of the pious and learned Mr. Rollock. In 1603 he took the degree of M. A. and was appointed professor of moral philosophy in his own college, a place which he enjoyed till the laureation of his class, in 1613. 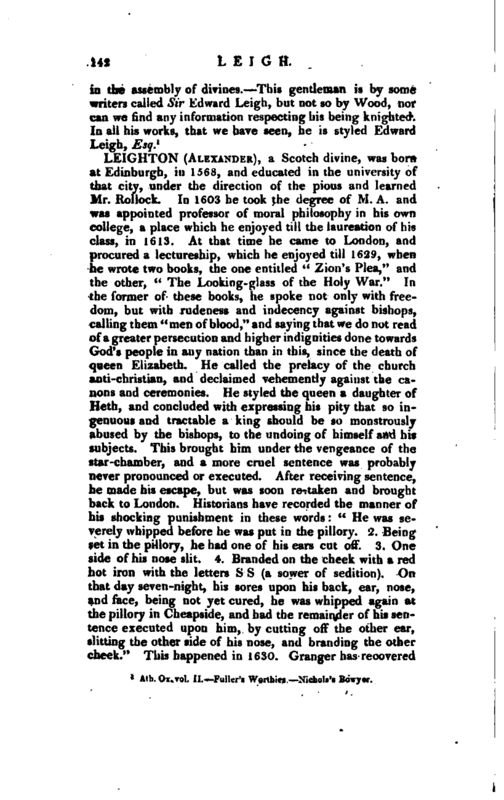 At that time he came to London, and procured a lectureship, which he enjoyed till 1629, when he wrote two books, the one entitled “Zion’s Plea,*' and the other,” The Looking-glass of the Holy War.“In the former of these books, he spoke not only with freedom, but with rudeness and indecency against bishops, calling them” men of blood,“and saying that we do not read of a greater persecution and higher indignities done towards God’s people in any nation than in this, since the death of queen Elizabeth. He called the prelacy of the church anti-christian, and declaimed vehemently against the canons and ceremonies. He styled the queen a daughter of Heth, and concluded with expressing his pity that so ingenuous and tractable a king should be so monstrously abused by the bishops, to the undoing of himself and his subjects. This brought him under the vengeance of the star-chamber, and a more cruel sentence was probably never pronounced or executed. After receiving sentence, he made his escape, but was soon re-taken and brought back to London. Historians have recorded the manner of his shocking punishment in these words:” He was severely whipped before he was put in the pillory. 2. Being set in the pillory, he had one of his ears cut off. 3. One side of his nose slit. 4. Branded on the cheek with a red hot iron with the letters S S (a sower of sedition). On that day seven-night, his sores upon his back, ear, nose, and face, being not yet cured, he was whipped again at the pillory in Cheapside, and had the remainder of his sentence executed upon him, by cutting off the other ear, slitting the other side of his nose, and branding the other cheek.“This happened in 1630. 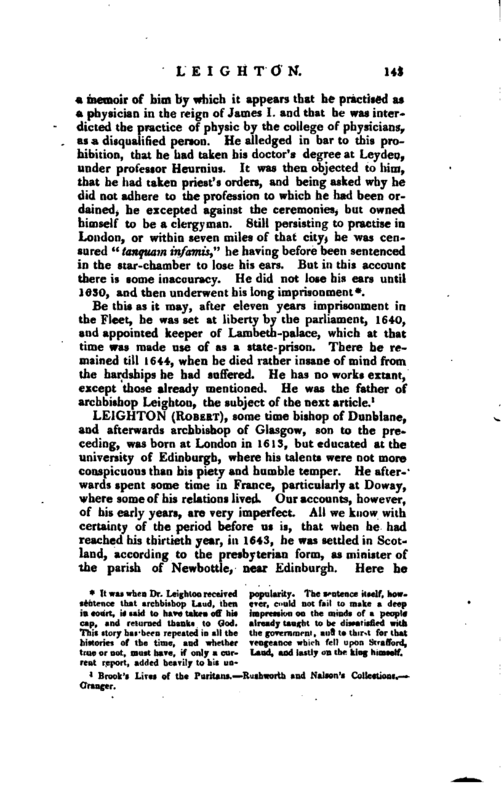 Granger has recovered | a memoir of him by which it appears that he practised as a physician in the reign of James I. and that he was interdicted the practice of physic by the college of physicians, as a disqualified person. He alleclged in bar to this prohibition, that he had taken his doctor’s degree at Leyden, under professor Heurnius. It was then objected to him, that he had taken priest’s orders, and being asked why he did not adhere to the profession to which he had been ordained, he excepted against the ceremonies, but owned himself to be a clergyman. Still persisting to practise in London, or within seven miles of that city, he was censured” tanquam infamis" he having before been sentenced in the star-chamber to lose his ears. But in this account: there is some inaccuracy. He did not lose his ears until 1630, and then underwent his long imprisonment*. Brook’s Lives of the Puritans. Rushworth and Nalson’s Collections. Granger.